Measuring 12 meters long x 6.5 meters wide you will instantly notice how spacious catamarans are compared to a similar length monohull yacht. Why spend your sailing time on a yacht at an unpleasant 30°? On our catamarans with a maximum heel of 5° your drinks and food stay on the table and you can even go to the loo without the danger of falling off! 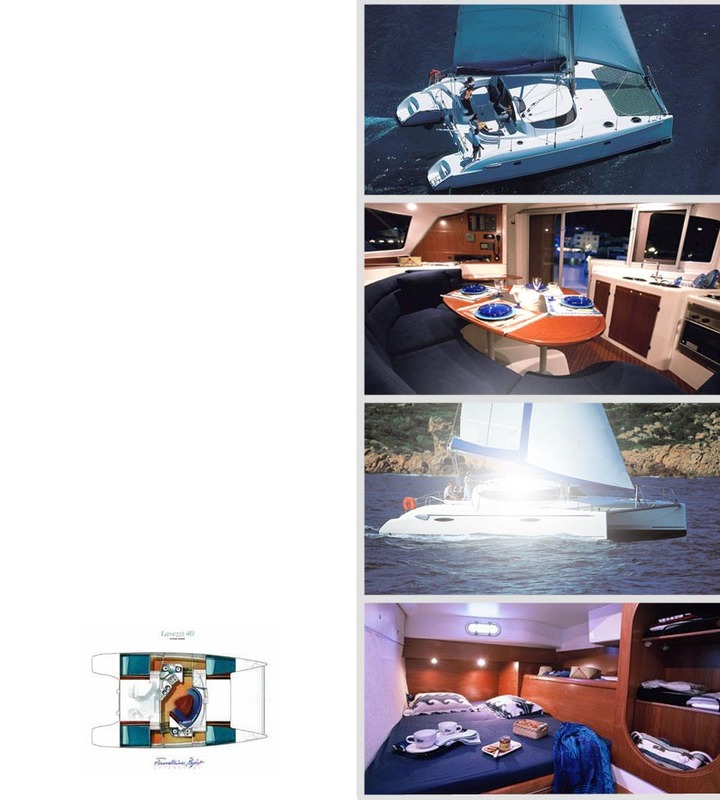 Its flat decks and stability make movement around catamaran easy and you can sunbathe in comfort on the trampoline between the hulls or on the deck forward of the mast even while underway. There is also ample cushioned seating in the cockpit which has a large bimini providing shade from the sun for everyone on those really hot days. There is full headroom throughout the saloon and both of the hulls, all four double cabins being spacious light and airy, all with generous sized bunks 2mt x 1.40/1.50mt and plenty of storage space. There are heads, showers and wash basins in both port and starboard hulls. Bathing steps and ladder on the stern of both hulls makes getting in and out of the water easy and the deck shower is convenient for a quick rinse down after swimming. The elevated helm station with twin helm seat gives a commanding view of the whole of the vessel and the simple well laid out rigging and winches make for easy sail handling and trimming. If there's no wind the two 27hp engines mounted in enclosed compartments set right at the stern, power the vessel along effortlessly at 7-8 knots.